The Letter Showdown Game is a self-motivated skill development letter recognition game that can be played by individual kids or students on teams. A "caller" says the name of a letter and students find them from among a group of letter flashcards. One-on-one, students compete against their own previous timed performances. In group interactions, teams compete against each other to find the letter first. It’s not only loads of fun—it helps even ADHD kids to focus, and speeds up the process of long-term memory storage, a requirement for recall of any information. 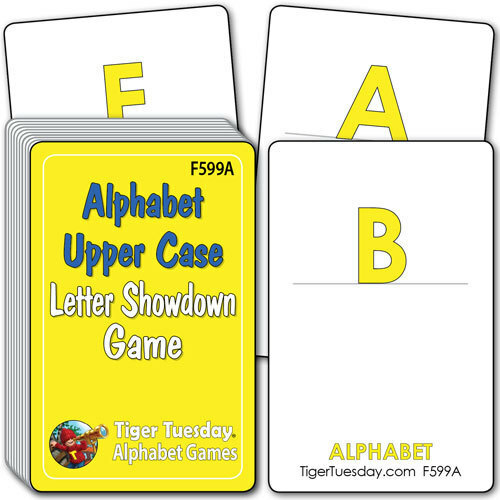 Game includes directions for Letter Showdown and two decks of upper case letter flashcards. Buy lower case set 599B, and mix the decks together as children progress to increase the challenge!